On days when I want to look a little fresher, I pull out my go to foundation stick. It's smooth, light and easy! Silver RIDEHOUSE Water Bottle- No brainer! I love watching the number on our water fountain go up as it counts how many water bottles were saved thanks to reusable bottles! Lavanila Sport Luxe Deodorant - Another no brainer! And you're welcome. Lacrosse Ball- I use it as a cheap and easy way to massage my feet, shoulders, neck and sometimes even my legs before and after class. It's called self-myofascial release and It. Is. Awesome. There are some fancier tools out there to use, but the lax ball fits perfectly in my backpack! Bose SoundSport Wireless Headphones - When I take my workout off the bike and into the weight room I still want the great sound experience that I’m used to in the studio. 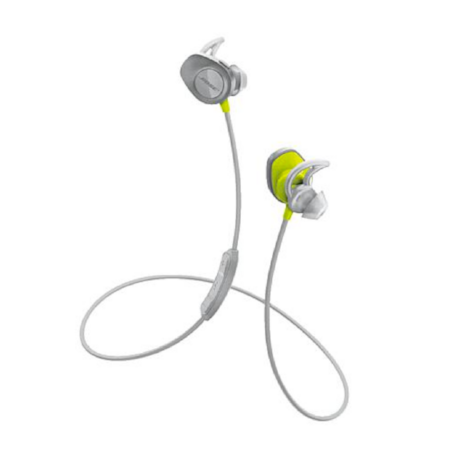 These are wireless, they stay in and are sweat resistant. Silicone Hair Ties - I have A LOT of hair. These rubber hair ties are the only one that get the job done. I can't be without them.